Table Top Banners, Folding Presentation Exhibits - Space Savers! 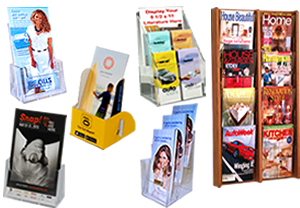 Table Top Banner Stands - Promote Your Business On Your Exhibit Table! 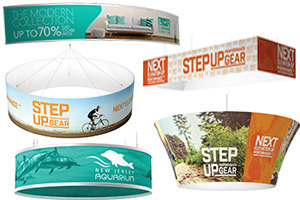 Table Top Banners & Folding Presentation Exhibits Will Grab Attention! 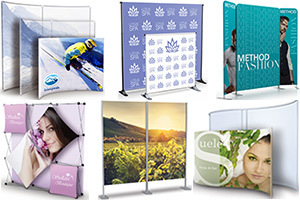 Table banners are perfect portable banner displays that offer a unique way to advertise you products and services. 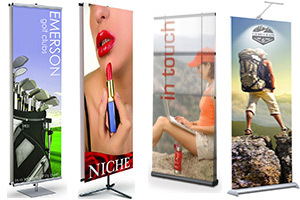 We offer both table pole pocket banners and snap graphic banners for counter tops. See below for details. 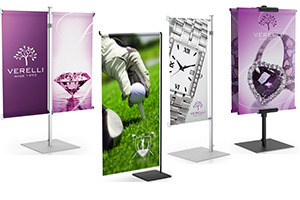 Pole Pocket Table Banners are vertical banner displays come with top and bottom dowels. Featuring a telescopic pole that allows quick height adjustments. Round and square bases available. Choose black or white. These vertical table top banners are light weight, portable and easy to travel with. Table banner display sizes range from 6"w - 18"w, 12"w x 24"w - 42" high. Snap Graphic Table Banners enable you to quick and easily insert your fabric or vinyl banners into open snap graphic grippers that will clamp your banner into place. Sizes range from 12" x 24" - 42". Mini Table Banner Stands offer a sleek elegant style featuring top and bottom dowels. Sizes: 6" x 13", 6" x 19", 9" x 19", 9" x 25", 12" x 25". Table Top Presentation Exhibits - Save Floor Space! Table Top Presentation Exhibits are a perfect way for exhibitors to get their message across by showcasing their marketing message clearly on a 3 panel presentation board while saving floor space at the same time. Folding panel displays enable you to display a specific marketing message on one panel, focus on graphical representation of your products and services on the second panel and outlining features and benefits on the 3rd display panel. Our presentation exhibits accept both semi rigid and rigid graphics and are lightweight, strong and portable. 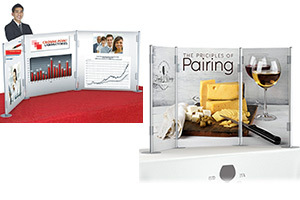 Gain a competitive advantage and stand out from your competition by displaying eye-catching graphics on your portable presentation exhibit. Please call our office today @ 866-550-0656 with any questions or if you cannot find what you are looking for on our website our knowledgeable customer service representatives will help point you in the right direction and find the right table top presentation exhibit or table banner for you.